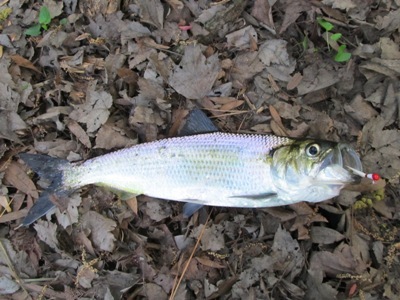 Hickory shad are the smaller of two species of anadromous shad that are native to North America’s Atlantic Coast. Hickory shad spend much of their adult lives in coastal bays or near shore waters. During spring, they make remarkable spawning migrations, sometimes traveling hundreds of miles up rivers, creeks and woodland streams to their birthplace. After spawning, most adults survive and move back into saltwater. Hickory shad are difficult to distinguish from American shad or river herring. Experienced anglers look for several distinguishing features when identifying the species from its relatives. Hickory shad are typically smaller than American shad. Similar to their larger cousins, they may have several spots along their sides. These spots are visible on the skin, but on some individuals, the spots are not evident when landed. Their coloration and shape is similar to blueback herring, but a few features help distinguish the two species. When seen side by side, hickory shad have a larger, more deeply forked tail than herring. Their lower jaw juts out noticably, where as the blueback herring’s lower jaw in roughly the same length as its upper jaw. Spots on hickory shad can be misleading. Some individuals clearly display multiple spots along their flanks while others seem to have only one spot per side. Because of this oddity, the number of spots by itself is not a good determining factor. Size may also help anglers in identification. Adult hickory shad are typically 14-12 inches in length, while blueback herring and other herrings are usually smaller. In the USA, hickory shad are managed by the Atlantic States Marine Fisheries Commission (ASMFC) under a Fisheries Management Plan for American shad and river herring.